We are at the very early stages of turning this old building into a working community arts centre. We run on a shoestring, and are gradually improving things. Here’s how things are at the moment. There is flat access from the street to the ground floor of the building via a shallow ramp to the right of the columns in front of the building. It is usually possible to drive into our forecourt from the street to unload (goods or people), before parking elsewhere (see below). Once inside, there’s a small (8cm) step up into the lounge/cafe area. Otherwise, the ground floor is step-free. There’s a shallow ramp inside each of the doors to the main hall (rises 6cm over 1m). Of the three in the building, the most accessible toilet is in the old vestry on the right at the end of the east corridor. The doorway is 72cm wide, which is enough for a wheelchair to get through, at least it was wide enough when we tested one that appeared to be a typical folding wheelchair. The toilet itself is currently through a second inner door, and somewhat cramped – it’s not possible to get a wheelchair alongside it. We hope to improve this soon. There is an accessible toilet in the nearby Moorish Restaurant, a few doors down the street, whose proprietor has agreed that anyone in the Arts Centre is welcome to use this when they are open. Across the street from this is a public disabled toilet accessible with a Radar key. The main hall where most performances happen has various areas where people in wheelchairs can sit, with good visibility of the stage/screen. Please let us know in advance if possible by emailing booking@ashburtonarts.org.uk if you’re coming and need a space to be reserved. Where Ashburton Arts is organising a performance, a free ticket is available for a personal assistant if required. Please email boxoffice@ashburtonarts.org.uk in advance if this is required. (We will ask other promoters to offer this as well – see below). The studio upstairs is reached by a carpeted staircase, 1m wide with 20 steps (18cm each). There are two of these staircases – one on each side of the building. They are mirror images of each other, and they both have a decent handrail on one side (so if someone has one good arm, they can ascend one staircase, and descend the other one, using the same arm to steady themselves). There is currently no lift to the first floor. At the moment, we don’t have a single central box office, so tickets for different shows can be had in advance in different ways, depending on who’s organising or promoting them. UPDATE: The lovely Rafikis, a new cafe/restaurant next door to the Arts Centre at 17 West Street, TQ13 7DT, is selling tickets for most events at the Arts Centre. This is cash only, for the moment, whenever they’re open, which right now is every day (except Thursday) until 6pm. Tickets for films are usually available in Gnash Comics (nearby on West St), and for Ashburton Live concerts at Silver Lion Jewellers on North Street (or online). Events at the Arts Centre are organised in various ways – some promoted independently, and some jointly with Ashburton Arts or by us alone. Right now, we use the online ticket sellers WeGotTickets where we can. Tickets there get 10% added as a booking fee and Ashburton Arts receives the face value. There are usually tickets available on the door, though for popular events this isn’t guaranteed. Where possible, rather than “full price (concession)” we’re offering a choice of ticket prices, eg “£13 or £10 or £6 – You Choose!” All the tickets are for the same, currently unreserved, seats. You choose the price you can afford. If you want to come to something, but can’t afford the full price, then please STILL COME, but pay for a cheaper one. Everything helps towards making things work. Or if you fancy coming to more than one show, but paying the top price for all feels like too much, then pay a little less, and see them all! Eventually we’ll get something sorted online that doesn’t add extra cost. If it’s not clear where to book in advance, email boxoffice@ashburtonarts.org.uk to find out. State how many tickets you want, and if possible, we’ll reserve them for you. Very limited parking for disabled visitors and access only in front of the building. 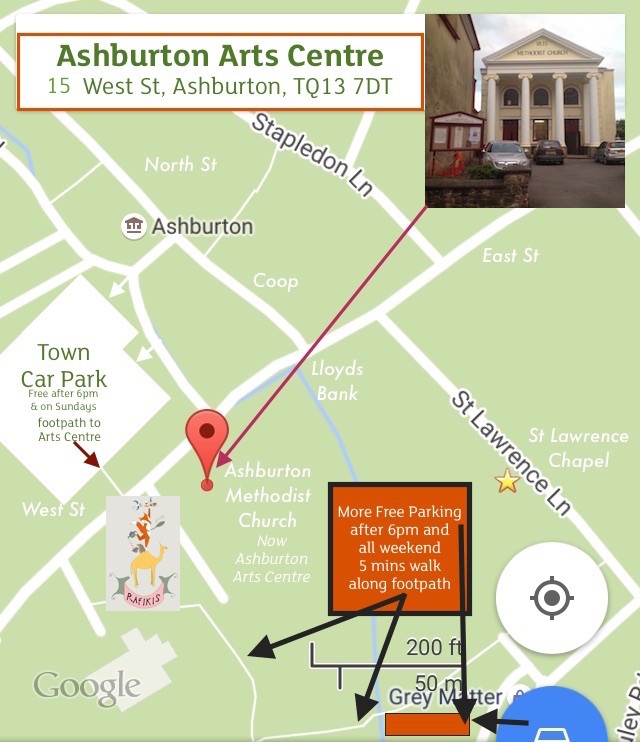 Public Car Park behind Ashburton Town Hall is cheap during the day, and free after 6pm and on Sundays. Footpath through tunnel from Long Stay car park comes out just across the road, next to Shanaz Tandoori. Free parking also available in the Greymatter compound on Chuley Road outside office hours (i.e. weekday evenings after 6pm and at weekends).